How do you improve upon a classic fudge brownie recipe? 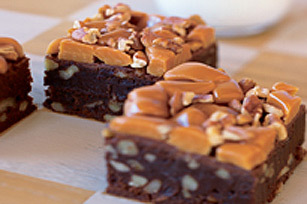 You add a layer of toasted pecans and creamy caramels and you get our One Bowl Caramel Pecan Brownies! PREHEAT oven to 350°F. Microwave 4 oz. Baker's Unsweetened Chocolate and 3/4 cup butter in large microwaveable bowl on HIGH for 2 minutes, or until butter is melted. Stir until chocolate is completely melted. Stir in 2 cups sugar until well blended. Add 3 eggs and 1 tsp. vanilla; mix well. Stir in 1 cup flour. Stir in 1 cup chopped pecans, if desired. Spread into greased 9-inch square baking pan. Bake for 45 to 50 minutes, or until toothpick inserted in centre comes out with fudgy crumbs. During last 5 minutes of baking, top with a handful each unwrapped chopped Kraft Caramels and pecan pieces. Cool completely before cutting to serve.